I grew up firm in the knowledge that camping meant spending a week in a tent with family. 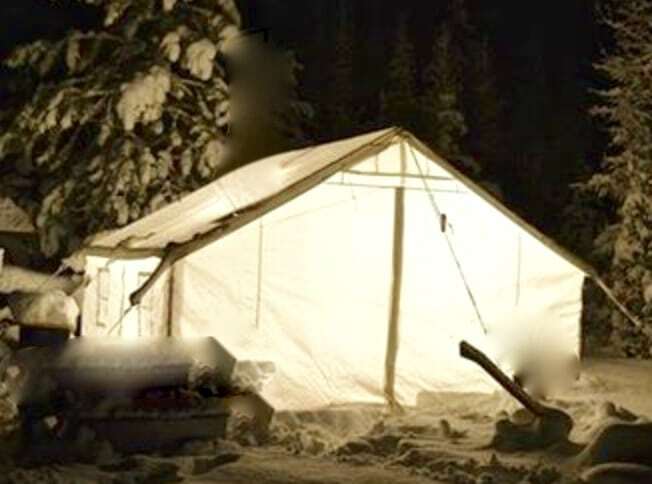 The tent in my memory was a relatively large brown canvas contraption. When it rained, we were told not to touch the top of the tent, and of course we couldn’t help but do exactly that. So we spent many rainy days damp as the water would drip into the tent where we put our hands on the top. We would be muddy and gross and cold and tired. But that’s really not what I remember of those trips. I remember the fun stuff. Things like going on walks with our guidebooks of birds and flowers, pointing out matches in the well-worn pages. Or helping with the camping chores. Sharing birthday cake with horses. Playing with other kids on the campground. Watching a moose swim across an Adirondack lake. Those were the memories of camping. My family eventually moved up to a camper, the kind that went on the back of a truck. That certainly took some of the hardships out of the camping trip, but I think I always had in the back of my mind that campers meant you weren’t really camping. So when my children were small, I took them tent camping. Because that’s what camping really means, doesn’t it? Unfortunately, they weren’t quite as into the experience as I was, so we didn’t go on too many camping trips. And for years, except for a night or two, my camping adventures stopped. 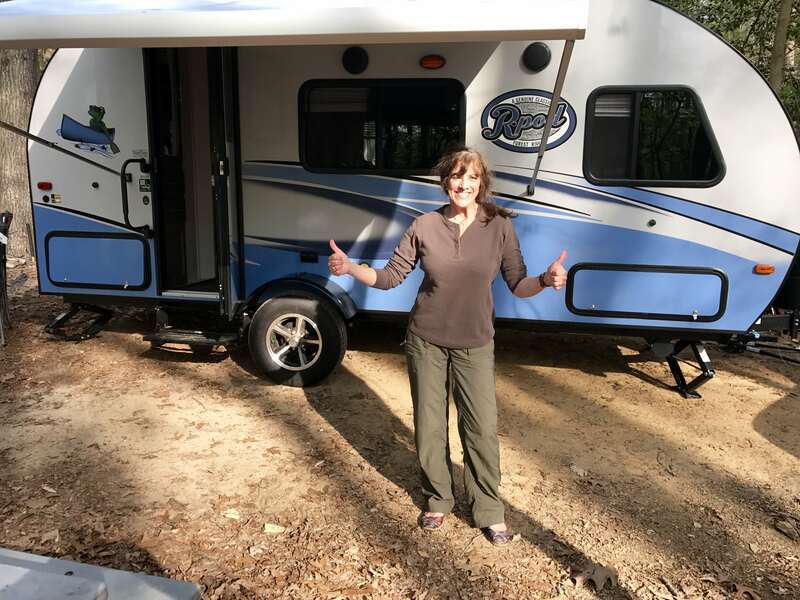 Recently, though, my husband and I purchased a trailer, an R-POD. This past weekend we took the trailer to a campground for the first time. I refused to call the experience camping, because there was no tent and we were going to be sleeping in a metal thing next to a bunch of other metal things. That hardly seemed like roughing it. Apparently, the definition of camping doesn’t have much to do with roughing it. Official sources all indicate camping is vacationing or residing somewhere temporarily. You could be in a tent, the outdoors, a camper or cabin. It doesn’t matter so much where you stay. So what was this R-POD experience like for a tent-believer? The experience was definitely more comfortable. There was a real bed, no sleeping on a rocky ground. Middle of the night walks to the outhouse or bathrooms (I remember how scary that could be) were not necessary. There was a small stove and microwave/oven, so if it was rainy out, food preparation was definitely easier. Our clothing was nice and dry from being snug in a drawer. And if we wanted to cave in to our need for comfort, there was heat for cold nights. No more shivering in a cold tent. Even with the trailer, we were still able to enjoy “real” camping experiences. The nightly campfires were just as enjoyable as always. Cooking over a fire and eating outside were true camping experiences. Taking hikes, watching wildlife, exploring and talking to other campers remained part of the adventure. Trying to light a fire with wet firewood, or spending time outside when it’s raining, well, that’s the same whether you have a tent or not. The only part of the experience I disliked was the closeness of trailers to each other. We selected a state campground in Delaware for our first outing. The description indicated it was a wooded campground with spacious sites. And I’m sure that was true in relation to other campgrounds, but it wasn’t private enough in my opinion. So on future trips we’ll have to do a little more research to find a place that is more in line with my thoughts of camping. So to answer the question, “Is R-PODing really camping?”, I’m going to say “YES.” All of the adventure associated with the outdoors is still quite possible. And for this mid/late 50s lady, being a bit more comfortable is a huge plus. So from now on, I’m going to refer to trips in the R-POD as camping. What do you think?